Seven years after the launch of the original Protect & Perfect serums from No. 7 at Boots they are launching two new serums. When the original serum launched it caused a media storm and it sold out in every Boots worldwide, they actually sold over a years worth of stock in a week! Well I imagine that the queues will be longer than before with their two new serums. The two new serums are Protect & Perfect Advanced and Protect & Perfect Intense Advanced are more targeted to specific age groups and they promise to bring better results than the original formula. I was lucky enough to attend the launch of the two new serums a couple of weeks ago but we were not allowed to write about it until today. I received the two serums so of course I had to test them. My Mum was delighted to try it out. As we only had a couple of weeks to test it before the launch I was not expecting to see any results. Well I was wrong, you can see a visible difference in her skin, the redness has subsided dramatically and the texture has improved. Fine lines and wrinkles have not improved as yet but I really have high hopes. The Protect & Perfect ADVANCED Serum, is aimed at people between 25 and 35. It’s designed to diminish the first signs of ageing. The Protect & Perfect Intense ADVANCED Serum is for the rest of us over 35 who have already seen the first signs of ageing and it promises to improve the appearance of deep lines and wrinkles. What makes it different from the original serum are the new amazing ingredients. To repair your skin they have the star ingredient Matrixyl 3000, which is in the original serum but it is in much larger quantities in these new formulas. To protect your skin there’s a patented antioxidant complex to help protect skin from unstable free radical molecules combined with inhibitors of enzymes that cause break down of structural proteins in ageing skin. No7 have really put their money where their mouth is and they have carried out multiple independent studies and they have been testing the products extensively and all the results have been made available. In fact this is their most extensive and comprehensive testing programme ever, involving more than 2,600 volunteers, 22 separate studies (including both consumer and clinical trials) and four clinical trials, including two key wrinkle clinical studies. In clinical trials the new serums has been put to the test against the original serums and the results all came back with the new serums winning hands down. 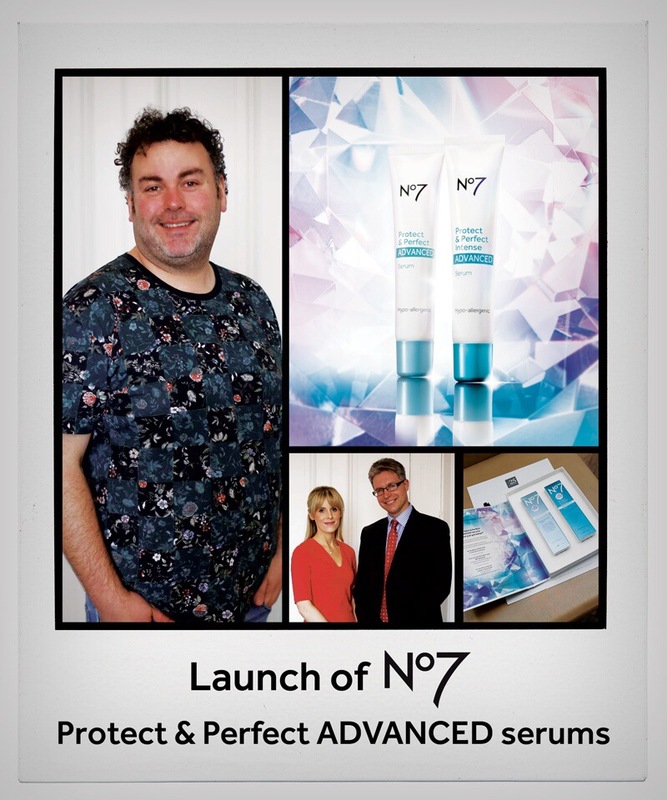 No7 Protect & Perfect ADVANCED Serum (€30.50 for 30ml) and No7 Protect & Perfect Intense ADVANCED Serum (€33 for 30ml) are exclusively available at Boots stores across Ireland and on boots.ie from Wednesday 14 May 2014. Here I am at the launch, mortified!! Next PostPhysicians Formula finally available in Ireland.